Josh is back and we need to move houses as our cosy apartment in West Hollywood is not available. I booked another apartment on AirBnB, but the communication has been slow or non-existent. I emailed the Owner when we wanted to be in, but never heard back. I call her the night before with no answer and leave a message. I call her several times that morning. 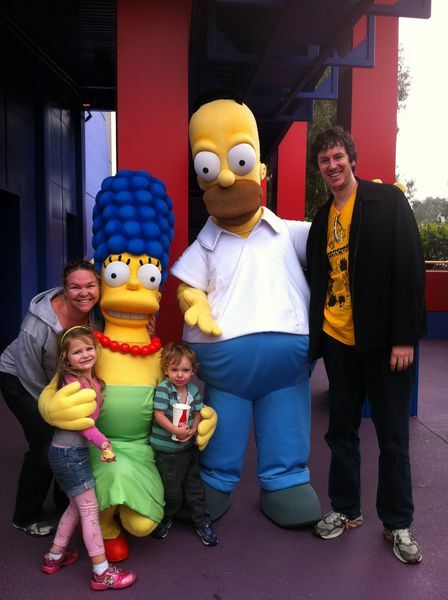 It's Sunday and we want to go to Universal Studios. It opens at 10am so we need to move in by 9am. At 10am I decide to walk the 15 minutes to the new place to see what is going on. There is no answer and so I walk back. I tell Josh to start looking at hotels cause we cannot wait around all day and our stuff has to be out of the other place by noon. When I am minutes away from our home, the new owner finally calls me and says she is there and I can come by any time. A taxi arrives in minutes and we drag all of our bags into it for the 5-minute taxi ride to our new location. I feel flustered. The Owner has no apologies, but is for all purposes very nice as if nothing has happened. She shows us to our apartment. While the communication and timing was exasperating, the apartment was not. It was like moving from struggling actor to TV sitcom star. The place felt like something you would see on a TV show and the room itself was very large and spacious. Giant living area, big kitchen, 1 bedroom and bathroom. I loved it. Its biggest failure was no air-condition and the ceiling fans only stayed on when the light was on. Josh took the globe out and then we could leave the switch on all night. 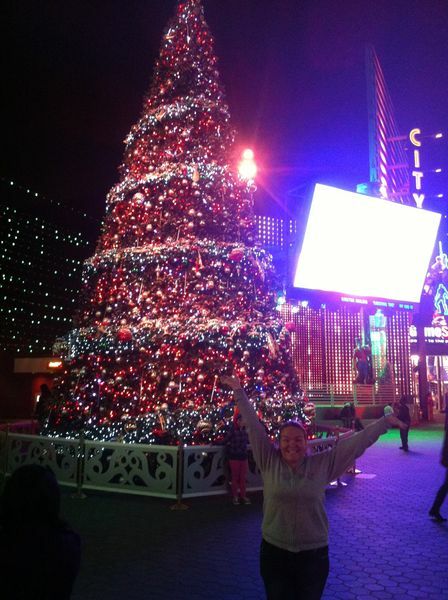 It's a 2 minute wak down the bottom of the hill and you are on Hollywood Blvd right by the Chinese Theatre. Wow. The location is unbelieveable. Pretty close to the Roosevelt Hotel, but much cheaper and roomier. We didn’t have much time to look around, as we were already so late for Universal Studios so we dumped our bags and ran back to our cab, who had been waiting patiently. Josh and I first went to Universal Studios in 2007. Since then we had been to the Singapore park several times. While it is similar in rides and attractions it has one major element missing and that is the awesome studio tour. The park is fairly quiet as there is a sprinkling of rain on a cloudy, cold day. 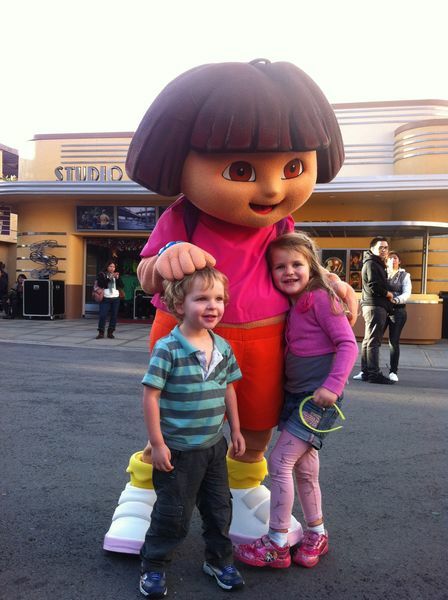 We manage to do all the rides quite quickly and the kids go into hyperdrive when they see Dora. 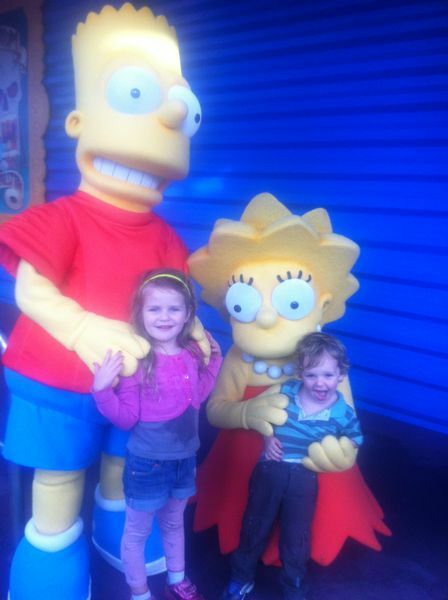 They also love meeting the other characters around the park. There is a lower level and an upper level to the park with plenty of new rides that weren't there on our previous visit so there was lots to do. Mia could go on most rides, Caius not. We skipped Haunted Mansion as none of us are particularly fond of horror. We also decide to skip the awesome Jurrasic Park ride, because none of us feel like getting wet. We make our first mistake on food when we both order a meal to be greeted by so much food! Josh has a steak with a giant potato and I get ribs with a giant potato. We eat half of our meal and realise we could have shared. From that day on we promise to only ever order one meal between us. And so far we've been on the money always full after sharing one meal. The kids favourite part of the day is the animal show. It features famous animals used in movies, like the dog from The Proposal or the bird from Ace Ventura. It was very entertaining. But my favourite part of the day is at the end. After all the rides we head to the studio tour. It’s getting dark and cold, but it’s my favourite part of the day. I love seeing all the movie sets and props and visiting Wisteria Lane! In 2007 we were not allowed onto the Lane because they were filming so it was great to finally see it. There was new additions and new cars & props. 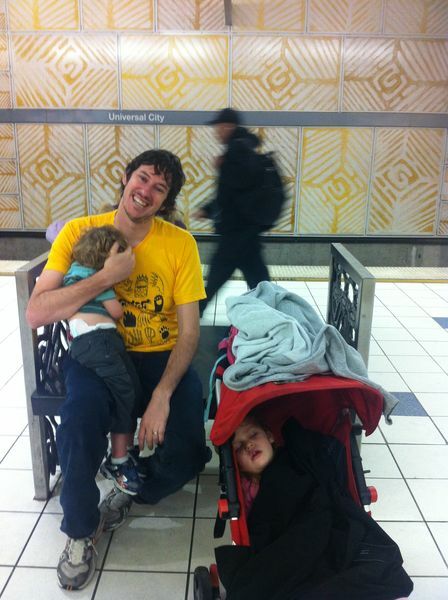 Both kids fell asleep, it was a great rest in between all the fun. The kids are tired and hungry and we think to head home. Since we are already here though we decide to stroll thorugh the City Walk, which is beautifully lit up not just with all the restaurants, but with Christmas lights as well. Mia has a visit with Santa. As it gets later Josh and I start having an appetite. Both kids have fallen asleep again so we change our plans and make our way via public transport to the famous In-N-Out burger joint. It’s busy and we wait in line to share one meal. It’s cheap, the burger is good, but the chips are lame. They get people in and out fast and efficiently and I can see the popularity of the place. 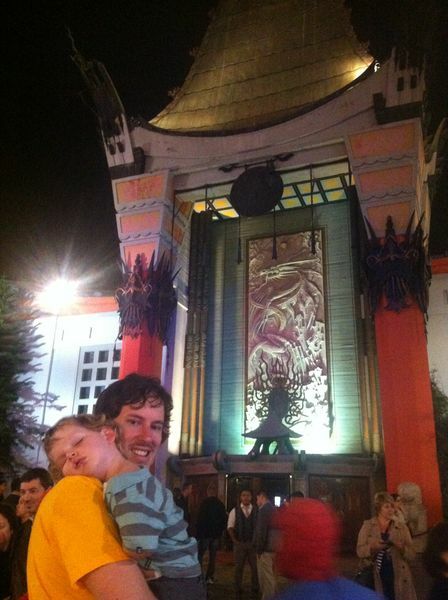 It’s fairly close to our new apartment so we walk home in the cold, exhausted, but happy, passing the Chinese Theatre. 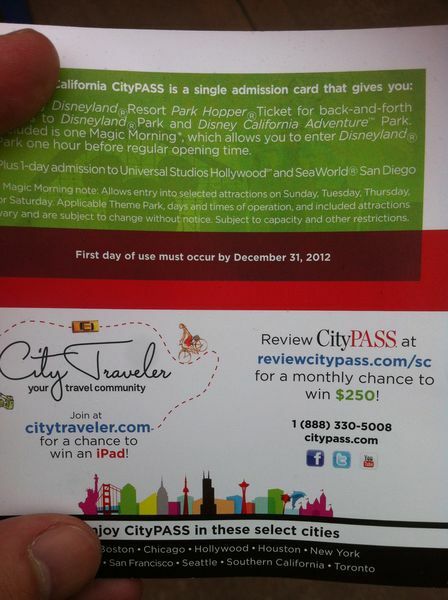 Our tickets to Universal Studios were included in the Southern California City Pass. Disneyland for 3 days will set you back about $250, however the City Pass saves you 32% and costs $279. 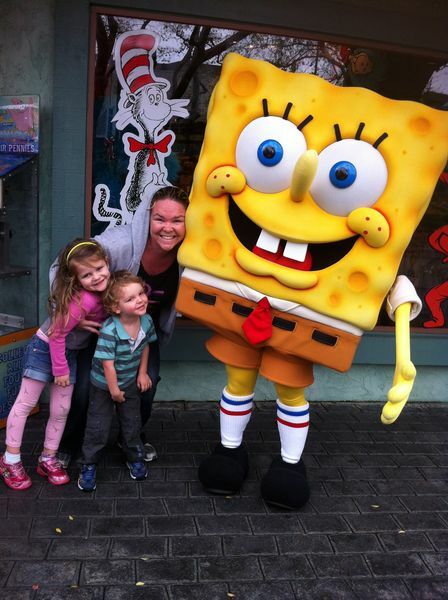 For that price you get 1 day at Universal Studios, 3 days at Disneyland/California Adventure Park & a day at Sea World. It’s quite a discount. On top of that you can add the Safari or Zoo in San Diego for extra. We spent nearly $1000 on theme park tickets, thankfully not having to pay for Caius. When compared to our activities in Asia it is a lot of money, however we were also celebrating my birthday and my daughter’s birthday during our week of Disney, so the special occasions lessened the sting. If you want to do all 4 parks I would highly recommend the Southern California City Pass. It's also available in other States around the US. That city pass thing looks like a great idea. I hate to think what we spent in Florida last year, but, you know, it's gotta be done! Worth every penny too. I'm looking at house exchanges to get us over there again, then, at least, the accommodation would be free. Great photos of you all having fun!